Viewing topic "problem to sync arps to cubase"
For this there is only one correct way to proceed. Go to TRANSPORT > PROJECT SYNCHRONIZATION SETUP… > MIDI CLOCK OUT > mark “Motif XS-1 (port 1)” only. Port 1 is for all communication of normal MIDI events including note, controllers, and tempo. Port 4 = reserved for use by USB for bi-directional communication with the Motif XS Editor. You are now set to control the Motif XS arpeggio tempo with Cubase. The Quick Setup #4 sets the Motif to slave to MIDI clock by setting the MIDI SYNC = AUTO. AUTO means that the Motif XS will derive the clock from the last incoming tempo that was feed to it. And you can actually audition the arpeggios in the Motif XS without having to have the transport of the Master clock device actively running. If you are not getting the Motif XS to sync to the tempo you have in Cubase, it is because you have not sent an active Tempo command, as yet. Remember it will derive the clock tempo from the last incoming tempo feed to it. Press Play on the Cubase Transport. 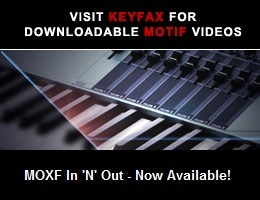 The Tempo will now be “known” by the Motif XS and it will be able to sync to that tempo even when Cubase is stopped. if I buy mLan and dimms, download AI driver from yamahasynth.com and make the firewire connectin between my laptop and xs hope that should be the best and most comfortable way of avoiding any farther driver related problems? You only need DIMMs if you want to sample or playback samples from your Motif XS.